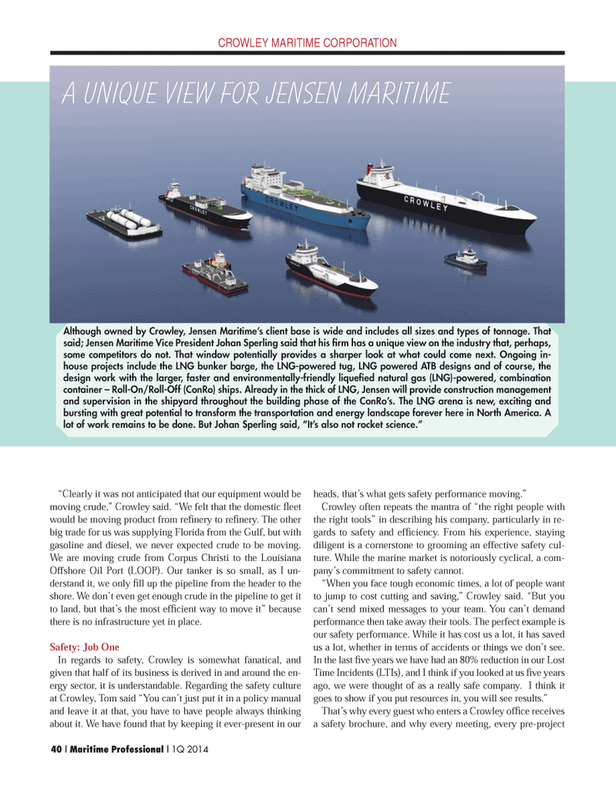 A Unique View for Jensen Maritime “Clearly it was not anticipated that our equipment would be moving crude,” Crowley said. “We felt that the domestic fl eet would be moving product from refi nery to refi nery. The other big trade for us was supplying Florida from the Gulf, but with gasoline and diesel, we never expected crude to be moving. Offshore Oil Port (LOOP). Our tanker is so small, as I un- derstand it, we only fi ll up the pipeline from the header to the shore. We don’t even get enough crude in the pipeline to get it to land, but that’s the most effi cient way to move it” because there is no infrastructure yet in place. Crowley often repeats the mantra of “the right people with the right tools” in describing his company, particularly in re- gards to safety and effi ciency. From his experience, staying diligent is a cornerstone to grooming an effective safety cul- ture. While the marine market is notoriously cyclical, a com- pany’s commitment to safety cannot. “When you face tough economic times, a lot of people want to jump to cost cutting and saving,” Crowley said. “But you can’t send mixed messages to your team. You can’t demand performance then take away their tools. The perfect example is our safety performance. While it has cost us a lot, it has saved us a lot, whether in terms of accidents or things we don’t see.